Surprised this wasn't done before, or at least I hadn't seen it before. 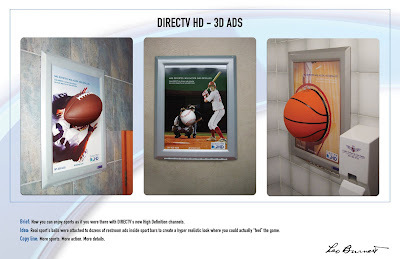 To emphasize the quality of HD TV, where you can almost 'feel' the game, they placed actual balls on the ads. Click if you want to zoom and read the case details. Didn't there used to be a 3D nescafe mug on the hoarding at the Point Depot? 3D items can certainly grab the attention. Guinness did something similar in pubs around town and particularly in the pubs around Croke Park for the recent series of rugby internationals. I don't have a pic but rugby balls were protruding from pub windows all over the place. And the windows were dressed to look as if they were cracking. It was a good idea let down a little by the execution of the cracking window.